Are you a teaching enthusiast? Are you looking for a teaching project that will enhance your ability while giving back to the communities in need? 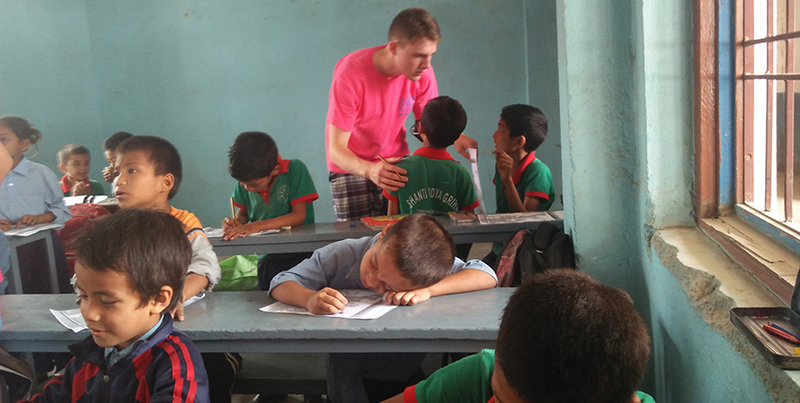 You should check out this teaching English volunteer program in Nepal. Enroll in our teaching project and help improve the English skills of students from poor and disadvantaged communities in Nepal. Your priceless contribution will indeed help enhance the deprived children’s educational and career prospects. English is in high demand in Nepal. Without a good command in English, most young students will not even pass high school or expect to have a good career in the future. Many parents and teachers put intense pressure on young students to improve their English. Unfortunately, most of the schools don’t have trained or experienced English teachers, and the students find it really hard to get better in English. As an English teacher volunteer in Nepal, you will work with small school children (6-13 years) in elementary school. You will organize extra-curricular activities like games, dramas and painting and hold debate and discussions to make your class fun and interactive. All in all, volunteering in Nepal in teaching English project offers a unique experience for you that you will cherish forever.